It has been nearly two years since the first disclosures of government surveillance programs by former National Security Agency contractor Edward Snowden and Americans are still coming to terms with how they feel about the programs and how to live in light of them. The documents leaked by Snowden revealed an array of activities in dozens of intelligence programs that collected data from large American technology companies, as well as the bulk collection of phone “metadata” from telecommunications companies that officials say are important to protecting national security. The metadata includes information about who phone users call, when they call, and for how long. The documents further detail the collection of Web traffic around the globe, and efforts to break the security of mobile phones and Web infrastructure. 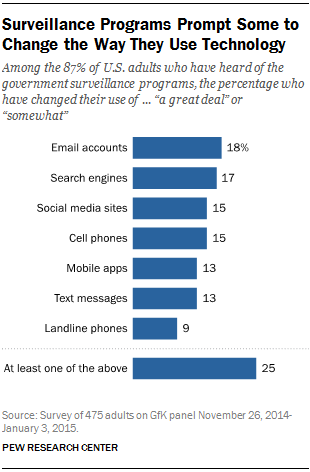 A new survey by the Pew Research Center asked American adults what they think of the programs, the way they are run and monitored, and whether they have altered their communication habits and online activities since learning about the details of the surveillance. 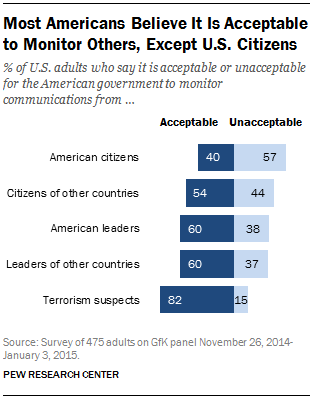 The notable findings in this survey fall into two broad categories: 1) the ways people have personally responded in light of their awareness of the government surveillance programs and 2) their views about the way the programs are run and the people who should be targeted by government surveillance. There are no partisan differences when it comes to those who have changed their use of various technologies. Additionally, a notable share of Americans have taken specific technical steps to assert some control over their privacy and security, though most of them have done just simple things. For instance, 25% of those who are aware of the surveillance programs are using more complex passwords. These figures may in fact understate the lack of awareness among Americans because noteworthy numbers of respondents answered “not applicable to me” on these questions even though virtually all of them are internet and cell phone users. 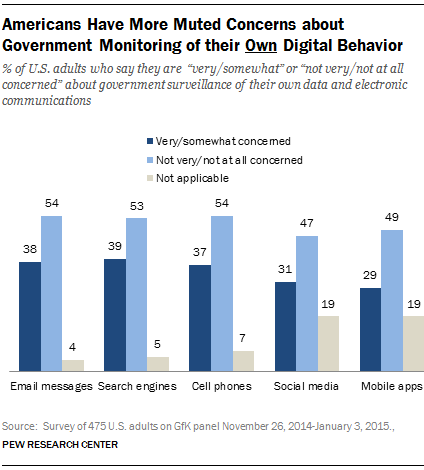 39% describe themselves as “very concerned” or “somewhat concerned” about government monitoring of their activity on search engines. The analysis in this report is based on a Pew Research Center survey conducted between November 26, 2014 and January 3, 2015 among a sample of 475 adults, 18 years of age or older. The survey was conducted by the GfK Group using KnowledgePanel, its nationally representative online research panel. GfK selected a representative sample of 1,537 English-speaking panelists to invite to join the subpanel and take the first survey in the fall of 2014. Of the 935 panelists who responded to the invitation (60.8%), 607 agreed to join the subpanel and subsequently completed the first survey (64.9%) whose results were reported in November 2014. This group has agreed to take four online surveys about “current issues, some of which relate to technology” over the course of a year and possibly participate in one or more 45-60-minute online focus group chat sessions. For the third survey whose results are reported here, 475 of the original 607 panelists participated. A random subset of the subpanel receive occasional invitations to participate in online focus groups. For this report, a total of 59 panelists participated in one of six online focus groups conducted during December 2014 and January 2015. Sampling error for the total sample of 475 respondents is plus or minus 5.6 percentage points at the 95% level of confidence.